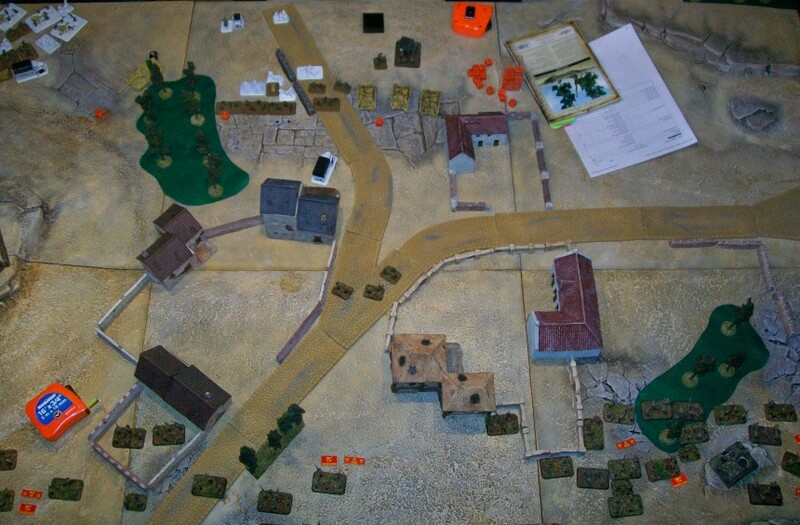 Large Soviet Co. spread out on left between two objectives, smaller one on right on third obj. 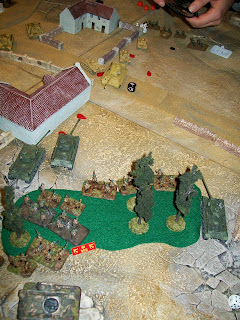 IS-2s in Immediate Ambush. 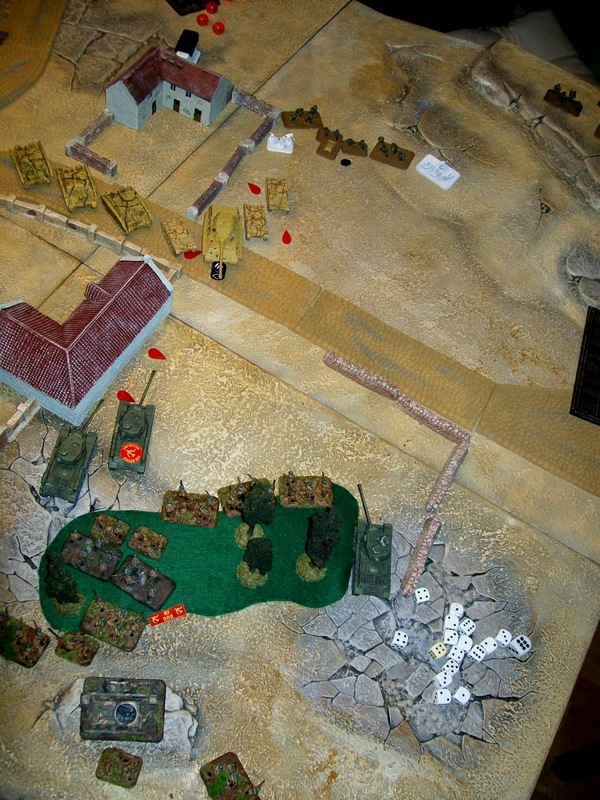 Soviet First Turn after springing the IS-2 Imm. Amb. No shooting as Brummbars are 7s to hit. 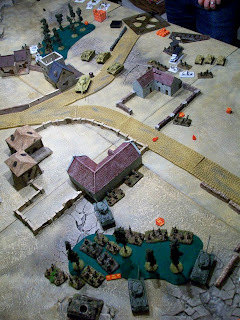 King Tiger counters IS-2s bottom of first turn. Brummbars hide. Nebs come on from Reserves. Soviets pull the Is-2s back and push forward with right flanking infantry. 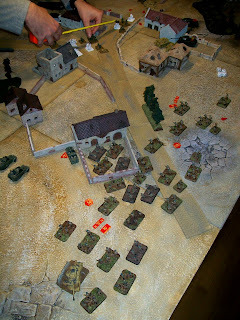 After getting lit up by MG fire the Infantry are pinned. Light tanks have come on from Reserves. IS-2s push through woods and use barn as cover. Su-57s move up after coming on board on turn 3. King Tiger rounds the corner after Is-2s took pot shots and missed the tankettes! 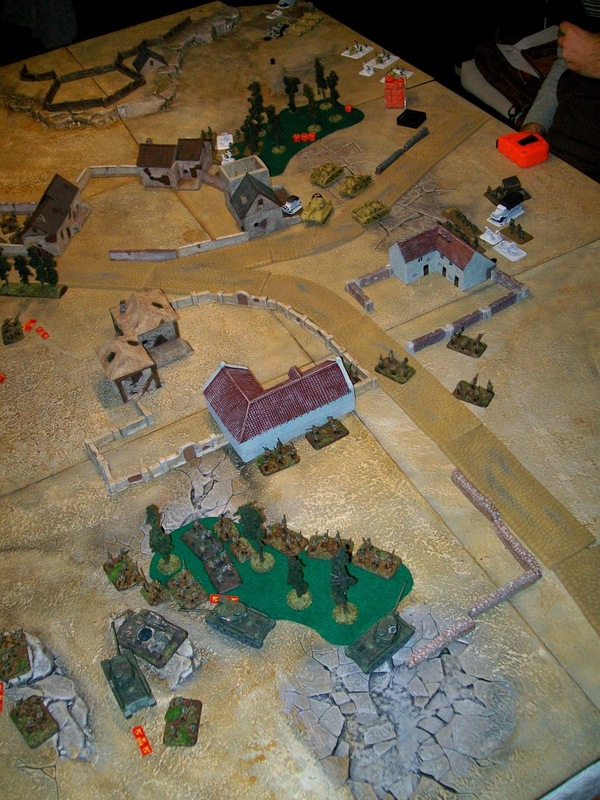 The remainder of the advancing Soviet infantry fall back to the tree line. Brummbars move up. 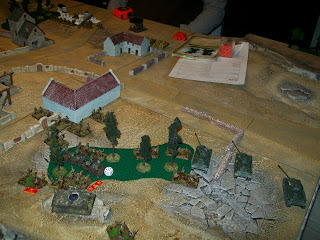 KT bails IS-2 with his one shot who fails to unbail top of 6. Brummbars Stormtrooper across center line to keep the game going! 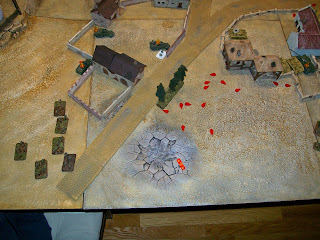 Brummbars flank and kill IS-2. KT bails and kills the other two. The double bailed IS-2 stays in the fight. 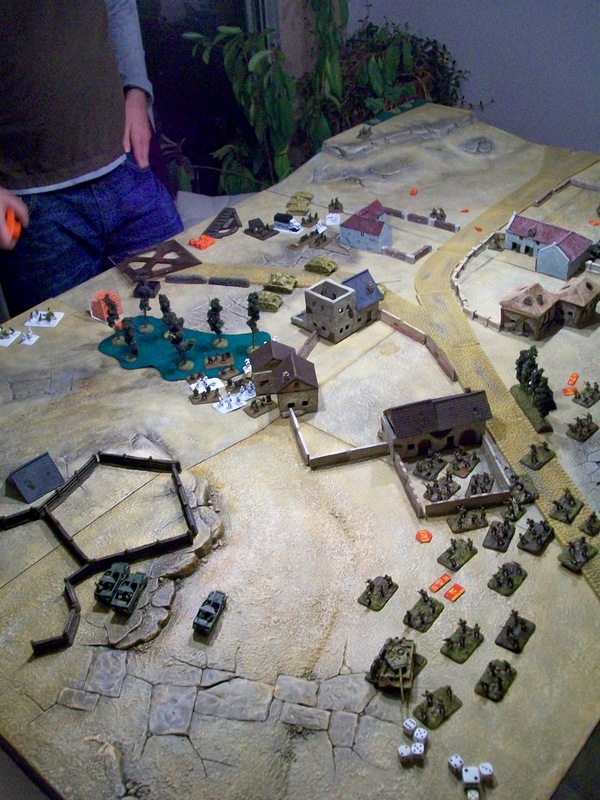 Nebs kept the big platoon pinned most of the first 6 turns. Even with 1iC and Kom rerolls...Notice Diragi moving his infantry from the crossroads into the compound with the Brummbars. *Foreshadowing some ugly Volley Fire from 45 mm AT guns*. Big Strelkovy platoon finally unpins and move up towards the Brummbars. Nebs and Goliath make short work of them (see blood bath below). They are so depleted their assault on the Brummbars and infantry in the compound (top right) utterly fails and they are forced to pull back with only the 1iC and Bat Kom still alive (and the 6 stands holding the left objective). 45 mm AT fire wipes out the German Pios with their 1iC and bails a Brummbar after the Brummbar and Shrecks kill the advancing Su-57s. 2 severely depleted infantry companies pass all of their Morale checks and are still in the fight! 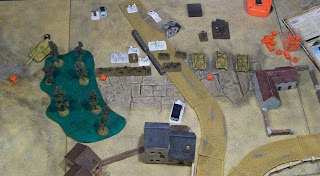 Lone Is-2 tries to flank the KT and 2 Flamethrower teams pop out of the treeline with 4 infantry stands. FTs kill the KT outright. 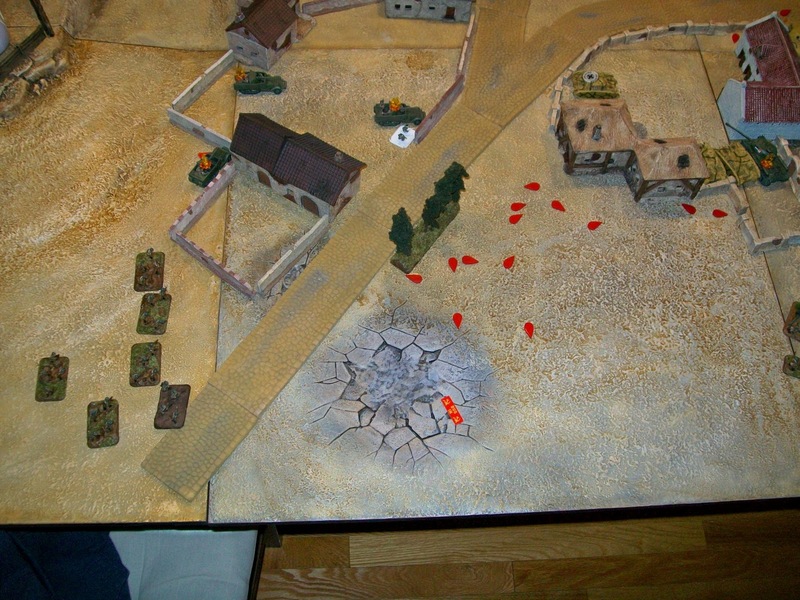 Infantry assault the tankettes and are wiped out to a man by 9 shots in DF. Soviet Infantry stay in the fight after getting below half. 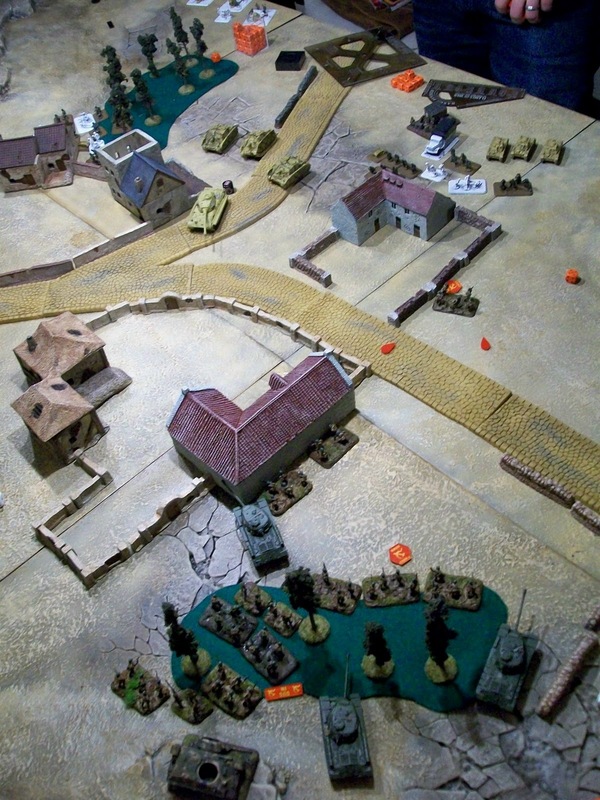 Germans counter and kill the IS-2 after bailing it with their own FT and then move into the treeline. 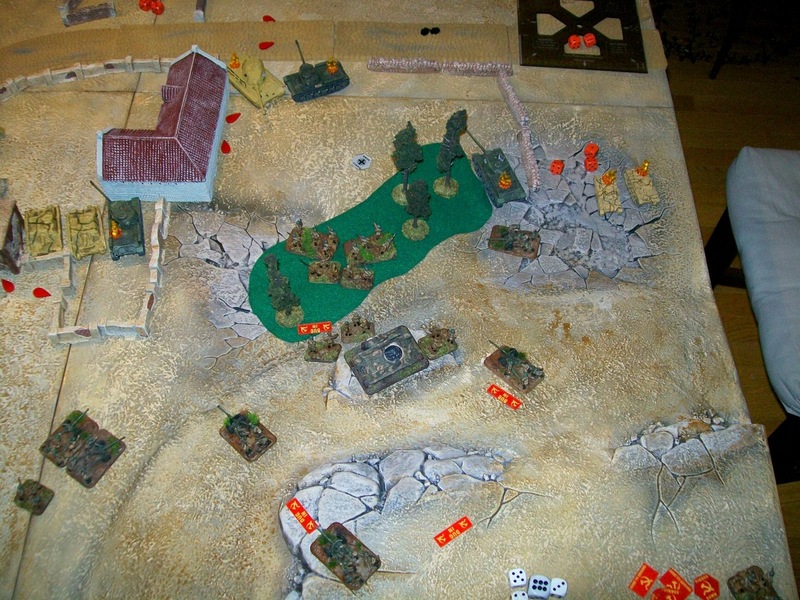 Tankettes flank right and take shots and AT guns on the ridge. 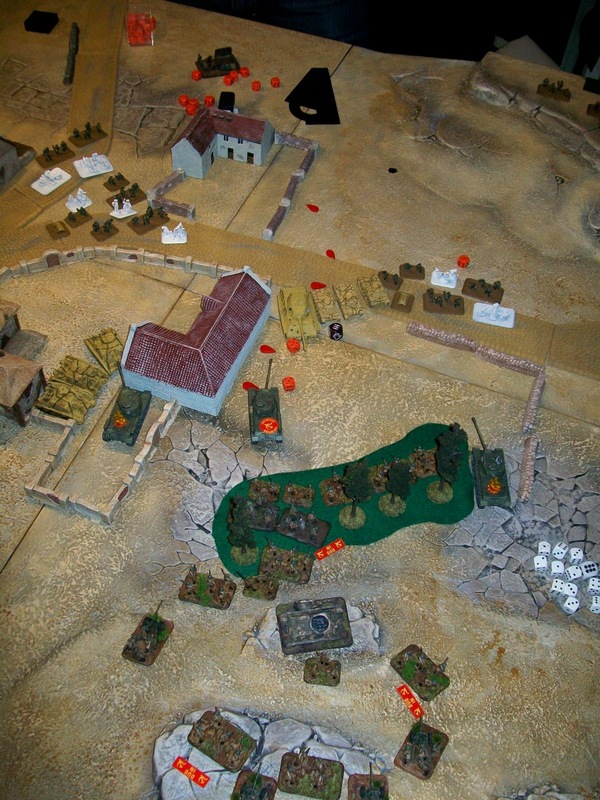 But the Soviet return volley fire is devastating killing 2 tanks and bailing the other who ultimately flee the board. 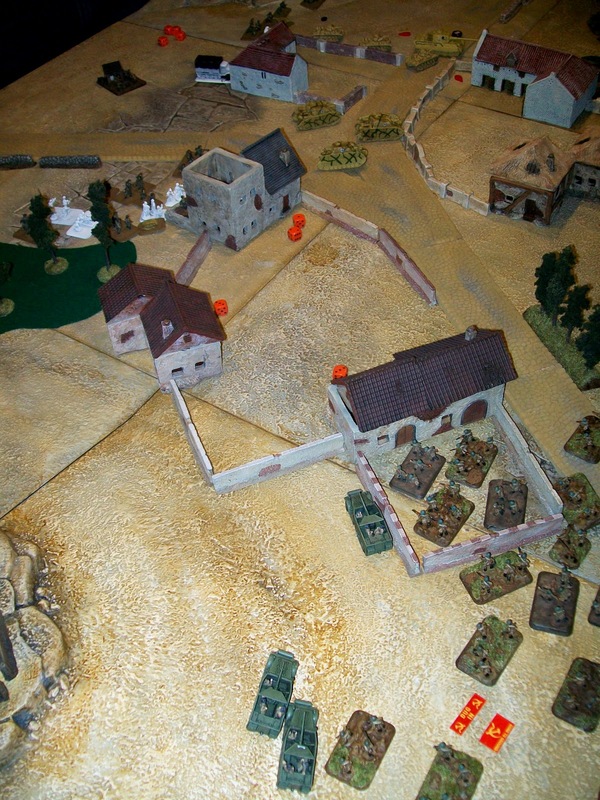 Infantry are reduced to 1 stand by Soviets and are destroyed in an assault. With their 1iC under a white tarp the Germans fail their Company Morale and the game ends. 4-3 Soviet win. What a blood bath. Not many pts remained on the table after that one. Large Soviet Co. had 5 bases left (down from 28) and the smaller one had 4 bases left (down from 18). I like KT's resilience -- its ability to be the lead element on attack when I need to get into the opponents half. Not sold on the horde of man held AT weapons (when combined w/ pios) but if I were to face a T-34 horde... Based on the last couple of games (attacking vs inf) the cheapness of Grens would have been better. The list going to be included/redone in Grey Wolf (Bagration compilation) so we'll see what's done w/ the pt values then. ps: those 45mms were a 'rude' shock! 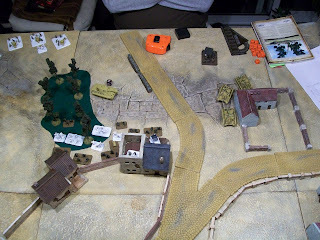 As I was spread out on a wide front they wiped out most of my army in one turn! I should have taken the cowards way out and gone to the other objective.